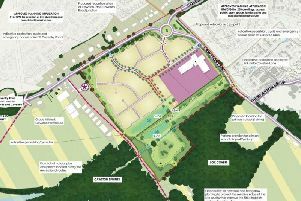 Rugby First has expressed concern over the effect plans to expand Elliott’s Field retail park may have on businesses in the town centre. The plans, named Elliott’s Field phase two, will see nine stores, mostly homeware and furniture retailers, begin trading by October. Aftab Gaffar, Rugby First managing director, said: “The town centre is still feeling the impact from the first application. “Footfall has dropped every month, customer sales have fallen, vacancy levels have increased, consumer confidence is low and we have lost some major retailers from the town centre. “It is only now – just over a year down the line – that we are beginning to see some signs of recovery with the opening of national retailers Pep & Co and the Edinburgh Woollen Mill, with The Works and Savers opening shortly. “The Hall of Fame and the town centre action plan, which includes town centre branding and the public realm strategy, are also likely to have a positive impact, although it is too early to see what that is likely to be at this point. “The town centre has a lot to offer. “We have a wonderful clean, attractive and safe town centre but also one that offers customers unique products and brands along with unrivalled customer service. “It is beginning to attract new businesses and investment and we are confident this can continue. “However, the plans for nine new shops and a restaurant for the second phase of Elliott’s Field retail park are going to have a major impact on the viability of the retailing function of the town centre. “The town centre has just passed a fragile period and any further out-of-town development could seriously affect its long-term viability with further losses of shops and investment. Cllr Heather Timms, Rugby Borough Council portfolio holder for growth and investment, said: “The changes in town centres are a well-documented trend taking place across the country. “Rugby Borough Council has led on a town centre action plan, with the full support of Rugby First, that will give the town centre the best possible chance to adapt to changing shopping and social habits. The stores to be opening as a result of Elliott’s Field phase two will include Dwell, DFS, Furniture Village, Oak furniture land, Tapi Carpets and Floors, Halfords, Carpetright and Starbucks. Two units on the site, immediately west of the existing Elliott’s Field area, are yet to have a confirmed retailer moving in. A spokesperson for CSP, a company which advises retailers and is involved with the development, said the two vacant units have attracted a lot of interest from retailers, and it is expected the units will be rented by homeware businesses. A spokesperson for Hammerson said: “Elliott’s Field Phase II is a £20 million investment in Rugby, creating 120 new jobs in addition to the £35 million invested and more than 380 jobs created at Elliott’s Field already. "The bulky goods retailers will complement rather than compete with the town centre, filling a recognised gap in the market and helping to retain spending within the borough. Planning conditions on tenants prevent direct competition with town centre shops.